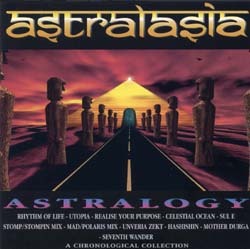 Astralasia had released a number of incredible singles in the early nineties, the majority of which had not appeared on any of their albums. There were a lot of people asking us to do a cd compilation of these singles so we obliged with this album. The tracks are arranged in chronological order and include a couple of rarities. One is the track 'Utopia' released as a promo 12" only and the other is 'Mother Durga' since the version on here features the vocals of Mel Taylor who had just taken over from Kim Oz who had left the band with Garry Moonboot to form Moonboot Oz. Kim featured on the original version.